Creepers. They're cool. They're edgy. They give you a little bit of height without the fear of twisting an ankle. 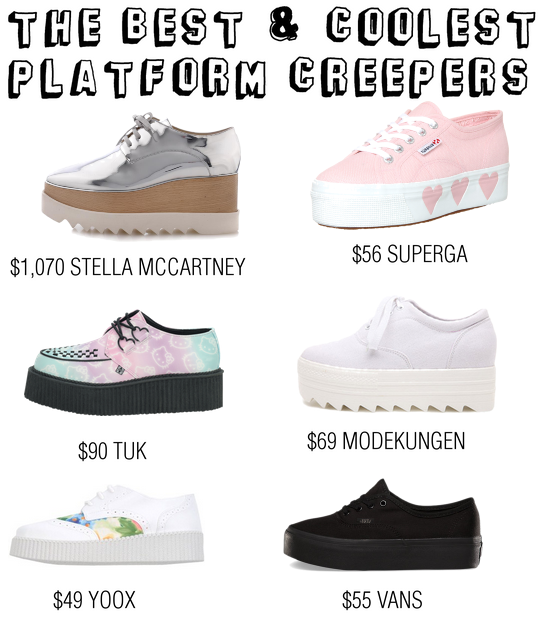 Originally developed as a fashion item after World War II, creepers are now a universal fashion trend...kind of. I remember my boyfriend used to wear TUK's in high school & I thought they were the ugliest thing on earth. Well, my opinion on that has changed. Dramatically. Stella McCartney is one of the only big name designers whose entire line is cruelty free. Her Elyse lace-up platform shoes retail at $1,070, but the high-shine metallic-silver faux leather upper, the chunky natural wooden wedge platform, & saw-edge white rubber sole give it so much character. Yes please! Superga Pink White Hearts Suki Waterhouse platforms are pale pink with lovely hearts bordering the sole. Wear your heart on your sleeve? Maybe it's time to wear it on your shoes! Want the ultimate girly shoe? The Hello Kitty Ombre Mondo Sole Creepers TUK Shoes are perfect for the pastel lovers out there. Or Hello Kitty lovers. Either way works for me. I love how sleek the Classic Spring Creepers by MODEKUNGEN look. The synthetic leather & canvas with a ridged sole give this all white creeper its own way to stand out. It's a classic. The floral design, round toeline, rubber sole, wedge heeled Primadonna Lace-Up Shoes from YOOX are ideal for spring. It has just a peep of floral to keep it relevant yet understated. Bonus points for it being faux leather. Vans are a personal favorite of mine, so the Authentic Platform with a low top lace-up silhouette, platform sole, durable canvas upper, & metal eyelets is an all-around favorite. Black as night & perfectly versatile. I love platforms! These are all such great boots, I find they give them an awesome look! Stella McCartney's has the coolest platform! I love the grunge vibe. very cute! I'm loving them all! I always loved creepers but never got a pair for my own. I must admit that I'm in love with the superga, it's so cute and pretty! I love the silver ones :d They look perfect! Wow! So cool! I love the TUK ones! Although I probably wouldn't wear this style, the Stella McCartney design is so unique - that platform is killer!! All of them are gorgeous but I especially love the tuk ones! 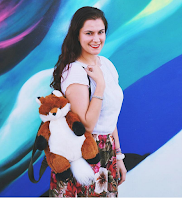 Super adorable yet cool! These shoes are seriously so great for someone at my height haha, thanks for sharing these picks. I love the Modekungen ones! I love these shoes! Such great finds! The pastel hello kitty creepers are so cute! I might be a bit boring but I like the black Vans. I find that when it comes to creepers I like to go the more subtle route and those fit the bill. I think that I would venture out a bit though and maybe try to Yoox pair too - plus they're really affordable for the design! Happy to see these in style again, they are so fun. Love the ones you chose, my favourite are the Vans. The black vans take me back.. I like the first pair too! This platforms are so cool, I wish they look good on me!! Have a a beautiful day! I love them, tug and vans are my favorites!! I have flatform sandals and they are my favorite pair of shoes right now! I must be old because I still think that these are ugly but I can see why the younger generation find those to be cool and trendy. Those stella Mccartney ones are so friggen gorgeous! I am absolutely in love with all the shiny goodness. I am too tall and way too old to pull off this look, but I love the $49 pair from Yoox... super cute! i still dont know if i could pull these off... but i love seeing other people wear em!! I want all of these so bad!! I love platforms!! I have one pair from Asos, but in you list, my favourite are the superga!! I like the black one ! I've never heard them called "creepers" before! Am I living under a rock?? Those Stellas are amazing! Gahhh I've been drooling over the Stella's for a while now - but I booked a trip to Tulum instead. lol.